Although Kobe, Japan is not on the list of world’s top 10 polluted cities, southern part of the city is heavily polluted. Southern part of this city have over 15 factories producing ships, steel, electronics and cars. It is surely a heart of Kobe’s economy and finance, however, it is causing a negative externality of air pollution. Factories are concentrated on the southern part of Kobe, Japan. These heavily-industrial factories release unknown chemicals into the air and pollutes the city severely. As a result of pollution, the inhabitants living around the area can suffer from several sever health problems such as respiratory problem, cancer, nausea and etc. Then, how could we possible solve this problem? There are three solutions to solve the problem. They are taxation, subsidization, and tradable permits. First solution to Kobe’s pollution is taxation. As you see in the graph, the pollution in Kobe is the negative externality caused by manufacturing of ships, electronics, and so on. Originally, this was not considered as a ‘cost’ to society, so this cost was not reflected. 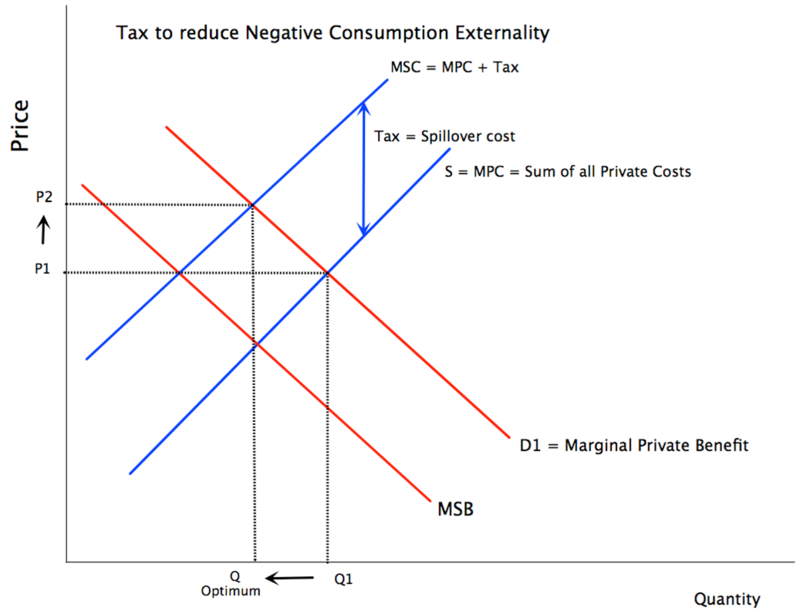 So the supply curve is on MPC initially, however, we can tax the producers to move the quantity supplied back to the optimum point of Q. The supply curve will go up to the curve of MSC which rightfully reflects the social cost of pollution. This way, the government can expect the effect of reduced pollution in the city of Kobe. However, there is one draw back to this solution. The consumers would have to buy the product at much higher price from P1 to P2 compared to before. The second solution is to subsidize firms that are employing more environmentally-friendly method of manufacturing their products or the firms that are developing eco-friendly technology. By subsidizing these kind of firms, the level of pollution in Kobe could decrease significantly. As you see in the graph, by subsidizing these firms, the price of these firm’s products will decrease from P to P1, and the quantity demanded will increase from Q to Q optimum. Increased demand of these products will increase the positive externality of reduced pollution in Kobe. However, this method is uncertain because we cannot quantify how much positive externality it will cause. The last solution is issuing tradable permits. Tradable permits are permits issued by governments allowing how much of pollution firms can create. If a firm exceeds the pollution rate it is suppose to create, the firm much buy a tradable permit from other firms. If a firm succeeds in reducing pollution and they have extra permits, these firms can sell the leftover permits to other firms that exceeded the pollution level. By issuing tradable permits, we can lower the pollution level significantly. Also, it encourages the firms to be efficient and lower the pollution level. If they lower the pollution level, they can sell their extra permits and gain profit. Many countries are told to be using this system to reduce pollution. In conclusion, taxation, subsidization, and tradable permits are possible solutions to the pollution in Kobe, Japan. The local government should now take action to reduce pollution in Kobe and make it a pollution-free city.